Size of this preview: 480 × 600 pixels. Other resolutions: 192 × 240 pixels | 384 × 480 pixels | 614 × 768 pixels | 819 × 1,024 pixels | 2,400 × 3,000 pixels. 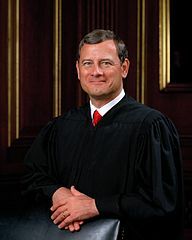 Official portrait of U.S. Supreme Court Chief Justice John G. Roberts.